What's worse than a bowl of Cap'n Crunch Berries? When you give your daughter insulin for them, and she doesn't eat them. What's worse than her not eating them? Her not answering when you're yelling for her, then whimpering a reply. Yikes! 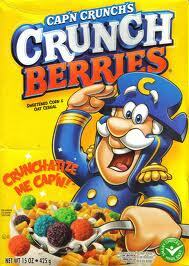 What's worse than dry Cap'n Crunch Berries? Getting-soggy Cap'n Crunch Berries. What's worse than convincing a child that the milk smells fine? Pleading with her to just taste it. So..she was having an unhealthy bedtime snack (well, it's corn and oats and..there's..Milk! ), and disappeared into her room while I was reading bedtime stories to Ethan. She was oddly quiet-and it was at least 10 minutes post-insulin. Umm..where was she and why was she not eating? She thought the milk was bad, so she refused. Sweet daughter? ..That's NOT okay! So..I'm teaching her she has to eat her junk food. Bad. But it was just sitting there, the perfect carb count for her insulin. Next time, I'll make a new bowl with new milk. Or give her alternatives. Or start pushing juice. Or freak out (in front of her) less. "Her not answering when you're yelling for her, then whimpering a reply." SCARY!!! That would make me jump up and go running!!! Glad she was all right, though!!! Ahhh...the good ol' freak out moments. We have to do something to keep our kids on their toes!